SHEIKHUPURA: Kidnapped from Punjab's Sheikhupura district two days ago, two minors are reported to have fallen prey to revenge killing. 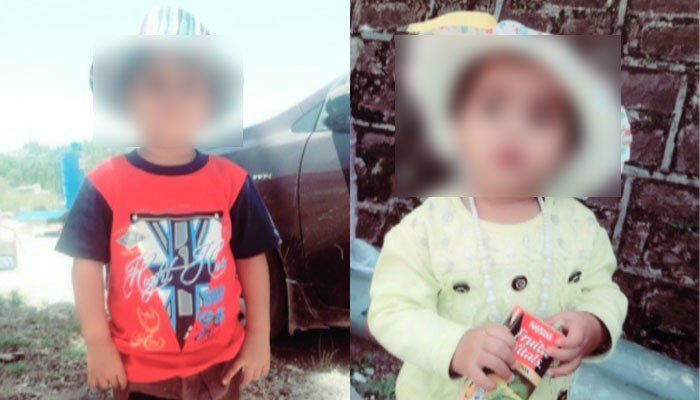 According to Geo News, the siblings identified as Tohid, 3 and Khadija, 2, went missing from Ferozpur Wattuan when they went to a shop to buy candies. The kids belonging to Jaranwala in Faisalabad district were staying at their grandfather's home at the time of disappearance. Shakil, father of the children, lodged a complaint with Bhikki Police Station expressing suspecion that the kids might have kidnapped. Police said they have arrested four people who allegedly threw the bodies into a canal. The police said the case turned out to be an act of revenge killing as father of the children was previously engaged to one of the suspects identified as Nabila who in collusion with three others suspects including two of his brother kidnapped the children before killing and throwing them into canal.